Bet you thought this post was going to be about some kid's outdoor water toy. No, it's more about the fine art of helping the Grandson learn how to pee in a toilet. My little Grandson is just learning how to go in the toilet, and he does a pretty good job, except that he sometimes holds his little wee wee too hard (and with both hands) as he's going. This, of course, leads to a situation we in the man's world call "no flow." He'll stand there for a minute and then say, "Pee pee not coming out, Papa." I'll look and confirm there is no flow and say, "Okay, let's wash your hands." This is when he releases his kung fu grip and sends water spewing forth with the surety of Old Faithful and the predictability of a Banzai wigglin water sprinkler. Papa ends up with a mess to clean. At the daycare he attends, they have the children lean forward on the toilet with their hands against the fill tank. He's done this a few times at the house and I find it somewhat disturbing. I mean, he's just three and already knows how to put his hands on the wall and "spread'em." Even though I applaud the person who came up with this, I must add that this person was undoubtedly a woman who normally sits and does not realize that any young boy (and some grown men) are so fascinated by the very act of urination that they must wiggle, shake, and aim the hose for maximum disbursement. Sometimes I wonder if it would be better to just let him go outside like he seems to like. Yes, there have been a few desperate times in a park or along the highway that called for such drastic measures. I didn't think much of it until one day, while playing in our front yard, the Grandson suddenly stops and whips it out not ten feet from the street. He'd already begun when he looked back at me and said, "I gotta go pee pee." And, being the wonderful Grandpa that I am, I just went ahead and let him finish. I've learned from experience, disrupting a male during the act of urination can result in serious psychological damage. I should be glad though. At least he hasn't tried this on a sidewalk in the middle of town, but we're all going out to a local children's festival today, so there's always the chance ... . I have four sons, three ex husbands, and an uncle who think any tree or bush is there for marking. when they were little, I had to watch the boys around cars; they always wanted to pee on the tire. I don't understand the urge . .
thanks for the Saturday laugh JL. I'm glad I could provide you with some entertainment. I have been accused of not taking things seriously. When Joey was potty training I would put fruit loops in the toliet and tell him "try to hit the target!" It took his focus off the act itself and got his sprinkles where I wanted them. It was also almost as much fun as going outside....almost. It's definitely easier raising girls, which surprised me. 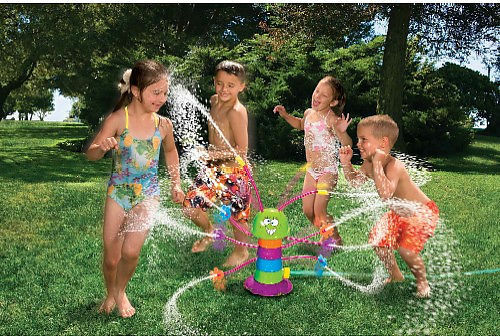 None of those wee-wee fountains that surprise you at bath time or changing time. You brought back memories with this. You guys have it so easy -- just point and shoot -- wonder if that's why some folks call 'em guns? Look on the bright side -- at least Nobody's been shot in the eye lately. The shooting part is easy. The pointing part--not so much.